Buddha was a popular teacher among his followers who worship him as a medium of life in this world as that of the heavens. The construction of divine images and their subsequent meditation and worship pureness in thinking and gave mental peace to the human being. 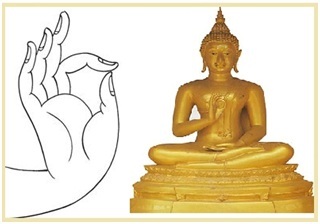 Buddha statues generally show a particular Mudra (a Sanskrit word) or hand gesture. This is because the followers of Buddha used symbolic gesture through the iconography of Buddha image to evoke particular ideas during Buddhist meditation or rituals. 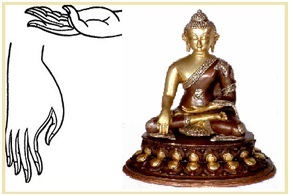 It is also called as the gesture of 'Teaching of the Wheel of Dharma' that describes one of the most important moments in the Buddha's life as he performed the Dharmachakra mudra in his first sermon in Sarnath after he attained enlightenment. It is performed with the help of both the hands which are held against the chest, the left facing inward, covering the right facing outward. It is also known as Samadhi or Yoga mudra. It is performed with the help of two hands which are placed on the lap and place the right hand on the left hand with stretched fingers (thumbs facing upwards and other fingers of both the hand resting on each other.) 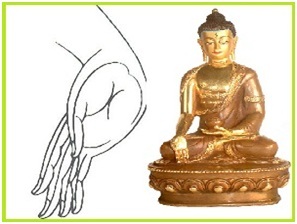 This is the characteristic gesture of Buddha Shakyamuni, Dhyani Buddha Amitabh and the Medicine Buddha. 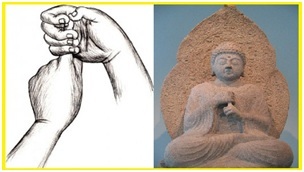 This gesture is also known as “touching the Earth” which represents the moment of the Buddha's awakening as he claims the earth as the witness of his enlightenment. 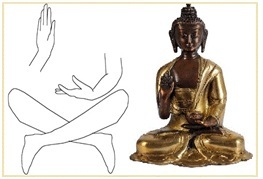 It is performed with the help of the right hand, which is held above the right knee, reaching toward the ground with the palm inward while touching the lotus throne. 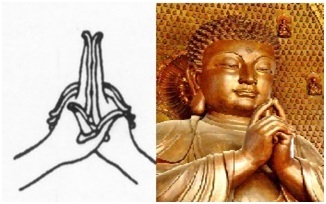 This mudra represents the offering, welcome, charity, giving, compassion and sincerity. 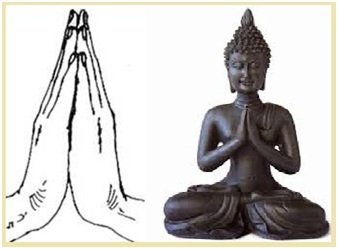 It is performed with the help of both the hands in which palm of right hand facing forward and fingers extended and left hand palm placed near omphalos with extended fingers. This gesture signifies the warding off evil which is performed by raising the index and the little finger, and folding the other fingers. It helps in reducing sickness or negative thoughts. 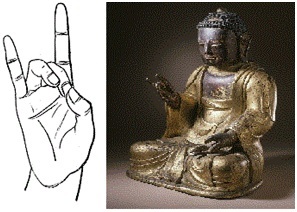 This gesture denotes the fiery thunderbolt that symbolizes the five elements, i.e. air, water, fire, earth, and metal. It is performed with the help of right fist, left hand forefinger, which placed by enclosing the erect forefinger of the left hand in the right fist with the tip of the right forefinger touching (or curled around) the tip of the left forefinger. It signifies the discussion and transmission of the teachings of the Buddha. It is performed by joining the tips of the thumb and the index fingers together while keeping the other fingers straight, which is just like to Abhaya Mundra and varada mudra but in this Mundra the thumbs touching the index fingers. It is a gesture of fearlessness or blessing that represents the protection, peace, benevolence, and dispelling of fear. It is performed with the help of right hand by raising to shoulder height with bent arm and the face of palm will be facing outward with fingers upright whereas the left hand hanging down while standing. 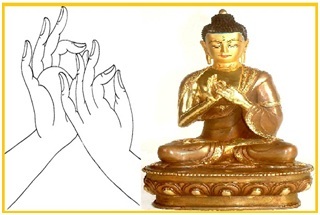 This gesture is characteristic of Buddha Shakyamuni and Dhyani Buddha Amoghasiddhi. 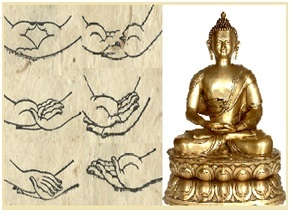 This gesture denotes the supreme enlightenment through connecting oneself with divine universal energy. It is performed with the help of both the hand, which placed at the heart and the index fingers touching and pointing upwards and the remaining fingers intertwined. It is also called 'Namaskara Mudra' or ‘Hridayanjali Mudra' that represents the gesture of greeting, prayer and adoration. It is performed by pressing the palms of the hands together in which the hands are held at the heart chakra with thumbs resting lightly against the sternum.